Charlie in the film “Charlie and the Chocolate Factory” would be stunned by what it is considered one of the most famous chocolate factories in Italy: the casa del cioccolato Perugina, the house of Perugina chocolate. If you are a family travelling to Italy this would be an ideal destination in combining your visit to the towns in Umbria with what is one of the greatest passions of children: chocolate. This amazing house of chocolate is situated in Perugia and was created by the famous Italian brand Perugina, the manufacturer of bacio, kiss, which is the symbol of the company. The symbol is a chocolate with a nut containing a little paper on which an aphorism is written. The house of chocolate includes different areas to visit: the historic museum, the factory, the tasting area, and the school. The museum was founded on the 90th anniversary of the company and it includes four main attractions: from cocoa to chocolate, the history of the company, products and distribution, and communication. Also on show are production and confection machines together with videos showing information and commercials from the year 1957. When in the house of chocolate it is possible to tour the factory and see how chocolate is made. The smell of this fantastic and beloved chocolate often inebriates visitors who can’t leave the house without having gone to the tasting area. It is here visitors have the opportunity to taste different types of chocolate that are produced by the company. Visitors whose tasting session is not enough can relax, there is the gift shop situated inside the factory where there is a range of chocolate and products to satisfy even the most demanding palate. 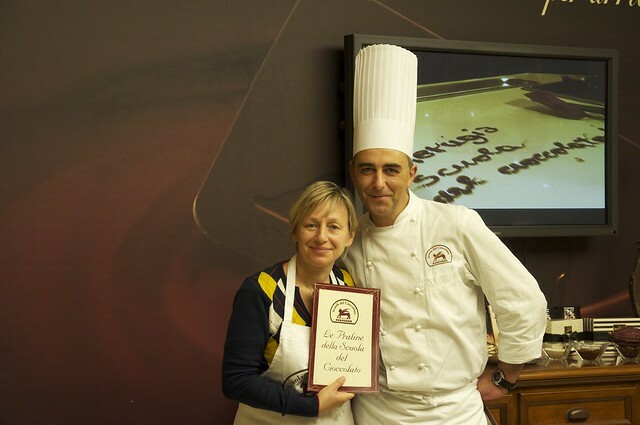 The Perugina organizes chocolate making courses using simple instructions so participants can make chocolate at home. There are many courses covering topics such as: how to decorate a Christmas tree with chocolate, the bunch of chocolate, St. Valentine’s Day chocolate and more. At the end of the course each participants receives a certificate for attendance. – If you come from the motorway follow the direction Perugia and take the exit San Sisto. – If you come by plane, the nearest airport is the international airport Umbria-Perugia-Sant’Egidio. The factory is opened from Monday to Friday from 9 a.m to 1 p.m and from 2 p. m. to 5:30 p.m. It is possible to visit the factory on Saturdays but it is occasionally closed. A ticket is 9 euros for adults, teenagers 13 to 17 years old pay 7 euros and for children 6 to 12 years old pay 4 euro, under 5 years old the entrance is free (price checked 2014). The house of chocolate will certainly be of high interest to children, and not only to children. It is the ideal place for all chocolate lovers: chocolate has no limits, no matter the age it is always appreciated!